"I have always been fascinated by wood, what a fantastic material it is. I grew up on the Swedish countryside and one day I realized that the spruce trees that had always surrounded me as a child were of the exact same spiecies as the ones used in the worlds most prized guitars and violins. I had never reflected over the fact that guitars were actually made by someone, and this realization lead me into the long journey of becoming a guitarmaker. I started by studying cabinetmaking and in 2004, I was accepted at Carl Malmsten School, a three year educaion in lutherie. Only two students were accepted each year, and during my years there I made everything from classical guitars and lutes, to steelstringed guitars and archtops. In 2006 i was accepted as in apprentice in Dana Bourgeois workshop in Lewiston, Maine. I worked mainly with voicing, something Dana is highly respected for. When I came back from the USA, I took my journeymansletter as a guitarmaker, and started to build my workshop. I also joined a team of luthiers to build a workshop for repairs, and I ran these two workshops simoultaneously. In 2008 I recieved a scholarship to go apprenctice with Ervin Somogyi in Oakland, California. 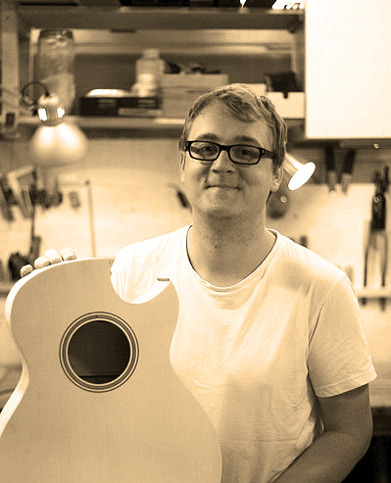 Ervins guitars are highly respected among fingerstyle guitar players around the world. During my five weeks there I was able to learn a lot of what has shaped the tone of my guitars today. I now run my workshop in Östertälje, a small town just 30 minutes south of Stockholm. "